The Pitt men’s basketball team’s streak of 16 straight winning seasons came to a crashing halt Saturday afternoon in Charlottesville, Virginia. The Panthers (15-16 overall, 4-14 ACC) put on their worst offensive performance of the season in the regular season finale against the No. 23 Virginia Cavaliers (21-9 overall, 11-7 ACC). The Cavaliers dominated from the start and never let the Panthers back in the game, winning 67-42. Senior point guard London Perrantes led the Cavaliers with 22 points in his final home game at Virginia, while Pitt’s 42 points scored marked the Panthers’ lowest-scoring output of the season. 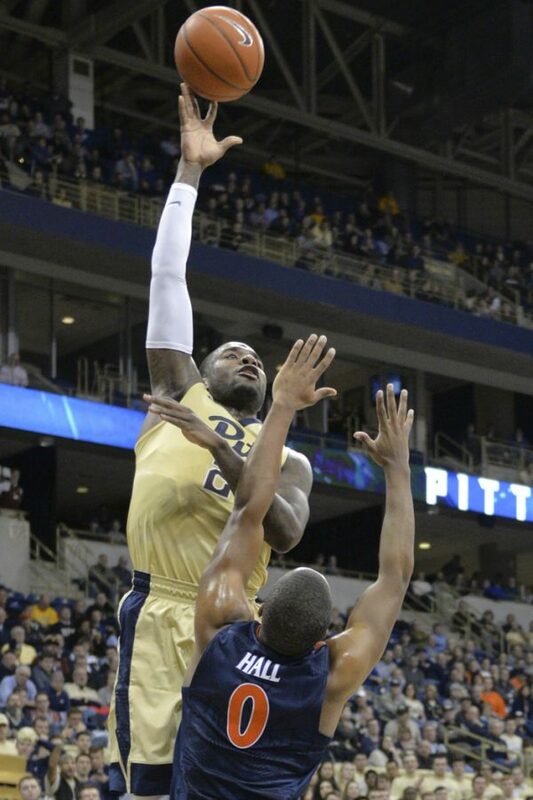 Head coach Kevin Stallings held seniors Michael Young and Jamel Artis out of Pitt’s starting lineup — reportedly for showing up late to breakfast — with disastrous results for the Panthers. Young and Artis were combining to average 39 points per game going into the contest, making up more than half of the team’s offensive production on the season. With the star seniors out of the lineup, the Cavaliers scored the first 10 points of the game. Pitt missed its first 11 shots and failed to make a field goal until Young and Artis entered the game with 9:57 left in the first half. By that point, the game was practically over, as Virginia held a 19-2 lead midway through the half. Pitt made its first field goal of the game on a driving layup by sophomore guard Cameron Johnson with just over nine minutes left in the first half. Young got on the board with a 3-pointer with 7:13 left in the half, then assisted junior forward Ryan Luther on a layup to make it 21-9. The Panthers’ run was short lived though, as Virginia point guard London Perrantes converted a tough 3-point play to put the Cavaliers back up by 15. An 11-2 run stretched Virginia’s lead to 21 before a pair of free throws by Young with 40 seconds left in the half. Johnson then made a putback dunk at the buzzer to make it a 32-15 Cavaliers lead at the break. Pitt’s 15 points scored represented the team’s lowest-scoring half of the season and tied for the sixth-fewest points in the first half in program history. The second half didn’t go much better for the Panthers, as Virginia scored the first five points to take its largest lead yet at 37-15. Pitt cut its deficit to 17 on a dunk by senior guard Chris Jones with 11:49 left, but the Panthers wouldn’t come any closer. The Cavaliers continued to convert from long range, stretching their lead to 27 on a 3-pointer by Perrantes with 4:22 to play. Virginia finished 11-of-22 from beyond the arc, while Pitt shot 4-for-20 from deep in the 67-42 defeat. The Panthers finish the regular season in 14th place out of 15 ACC teams with a 4-14 record in conference play. Their 15-16 overall record gives them their first losing season since the 1999-00 season, Ben Howland’s first year as head coach. Pitt will take on the No. 11 seed in the first round of the ACC Tournament at 7 p.m. Tuesday, March 7, at the Barclays Center in Brooklyn, New York.